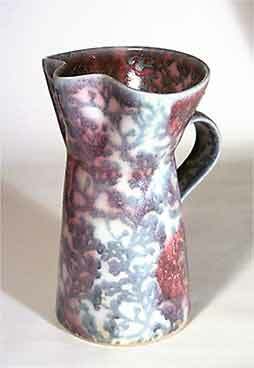 Large Dartington jug - 9¼" (234 mm) high. The Dartington Pottery Training Workshop, now known as Dart Pottery or Dartington Pottery, was set up in 1975 in South Devon. David Leach had the idea of forming a 'community workshop' in 1972. His father had worked at the site in the 1930s. Marianne De Trey worked there until the early 1980s. The pottery was bought out by Peter Cook, Stephen Course and Peter Hazell in 1984, and is now run by Sue Cook and Stephen Course, who employ around fifteen people. Janice Tchalenko and Tavs Jorgensen have strong connections, providing designs to augment those that originate from within the company.